In 1911 when Editor Tess Flanders said: “use a picture. It’s worth a thousand words,” she’d hit the nail on the head about the soon-to-be popularity of photography, videos and visual media that floods our lives today. A picture does speak a thousand words and picture research – looking at them closely and researching what they say – is particularly useful to telling the story of The House of Mirelle. In my possession are some amazing ones; combinations of snapshots and studio shots, some formal, some informal and all illustrate words on the page in multitudes of ways. I’ve been taking a tour of Hull over the last few weeks, looking at pictures from between 1938-1945. For those reading who do not know why that time is important, it’s because the centre of Hull is not the same as it was then. There’s the changes to architecture and town planning that happened in post-war Britain but it’s also because Hull experienced a bombing campaign that changed the landscape of the City forever. It’s known as The Hull Blitz. Pre-war, the City centre was a hustling, bustling commercial powerhouse. Large department stores with acres of local history behind their names stood proudly on the main streets. Edwin Davis, Bond Street Hull. A store destroyed twice by enemy action. First in WW1 by bombs dropped by Zeppelins it was again flattened in the May 1941 bombings of The Hull Blitz. Rebuilt and reopened in 1952 it traded until 1978, closing as a retail outlet forever. Thornton Varley, Hammonds, Edwin Davis and Costello’s were as much a part of the landscape as the watery homes for ships, boats and trawlers docking nearby. Some of the locations radiating from Victoria Square still exist. King Edward and Paragon Street, Jameson and Savile Streets, you can walk down them all but the landscape, the cityscape without the figureheads of Hull’s past isn’t the same. Building and regeneration has long spirited it away but if you are looking for connections, ‘ghost pictures’ like those on Hull and East Riding At War, can overlay the then with the now. The half and half pictures show the changes in the City and also how life in 1939 was very different from today. Prospect Street lead you to the hospital – the Hull Royal Infirmary. Long before the NHS it survived by payments and charity and stood in flat fronted austerity where the Prospect Centre is now. Opposite was the entrance to Albion Street marked by the red brick library on the corner. It lead at right angles from there to Kingston Square. Madame Clapham and The New Theatre were at the end and along it on either side were 3 story houses sooted and blackened by industry. 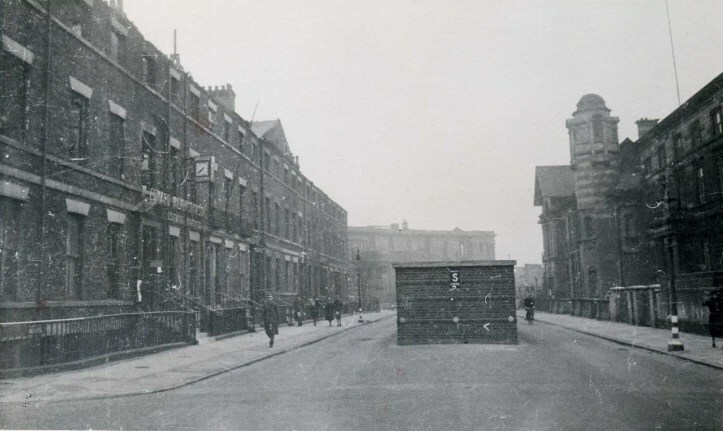 The left side of Albion Street pre-world war 2. It shows the Library, The Church Institute and Albion Congregational Church. The Church was destroyed in 1941 during The Hull Blitz. Albion St. in 1939 was vibrant and busy with private businesses, doctors, estate agents and homes. One side had the Congregational Church, nestling slightly away from The Church Institute, a centre of learning that held talks and meetings in a big lecture theatre inside. Where the car park is now was a huge museum which looked like the Church in announcing itself with an impressive colonnade. It housed Hull’s collection of art before Ferens Art Gallery opened but sadly like much of the road and the life taking place there it was annihilated in The Blitz. The photo I’ve been looking at hardest and longest is this one. Its shadowy, scratched surface has pulled me into it, as if I’m the photographer taking a photo of this unique sight. The photo shows the Air Raid Shelter built as part of Hull’s defences. With a lot of people working and living nearby – more than there are now – it would have been packed as the sirens wailed. Behind it the outline of The Hull Royal Infirmary sits in a cloudy early morning sky. People walk sparsely along the street, some men, some women and the road is deserted of cars and buses. Only one cyclist is pedaling along the left hand side. Then I look at the man walking past Wilkinson’s and Sons Estate Agents. Is he wearing a hat and uniform greens? It’s hard to make it out in the speckles alongside but I think he’s looking into the camera as honestly as facing war. Opposite, The Library and Church Institute are not yet, in that day, alive. It’s the stillness and calm of this photo that makes me stop and look. It’s the calm before the storm that rained from the skies. Albion Street has altered completely and from one side to the other you can see relics of the fight. Royal Institute, Albion Street Hull. Bombed in The Hull Blitz and completely destroyed. Nowadays with mobile phones the photos would be in colour and have sound included. The pictures taken by the press are the most prominent record of the Nazi bombing campaign. I use their photos to imagine the great bowing and crush of beams and brickwork engulfed in roaring fires. I think about how it must have been to walk through decimated streets those mornings to find you were no longer employed. Knowing these images as well as I do I think it’s fitting that the stirring beauty of these and many more heralded the opening of Hull 2017. Opening of Hull City of Culture via You Tube, Adam Reeve.